This is an IETF (Internet Engineering Task Force) standard communications protocol designed to allow mobile devices' (such as laptop, PDA, mobile phone, etc.) users to move from one network to another while maintaining their permanent IP (Internet Protocol) address. 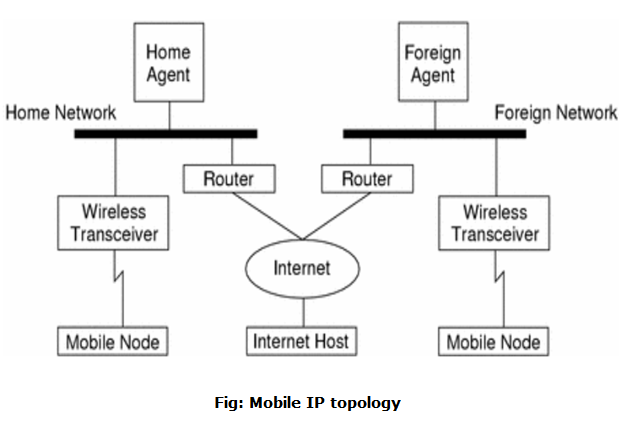 Defined in RFC (Request for Comments) 2002, mobile IP is an enhancement of the internet protocol (IP) that adds mechanisms for forwarding internet traffic to mobile devices (known as mobile nodes) when they are connecting through other than their home network. 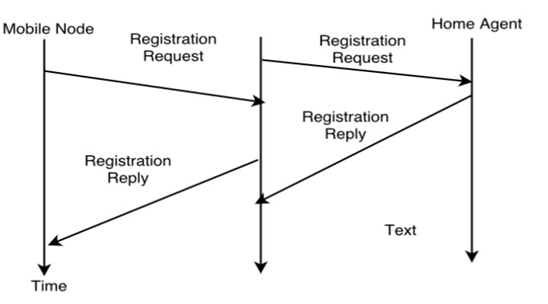 The following case shows how a datagram moves from one point to another within the Mobile IP framework. First of all, the internet host sends a datagram to the mobile node using the mobile node's home address (normal IP routing process). If the mobile node (MN) is on its home network, the datagram is delivered through the normal IP (Internet Protocol) process to the mobile node. Otherwise the home agent picks up the datagram. If the mobile node (MN) is on foreign network, the home agent (HA) forwards the datagram to the foreign agent. The foreign agent (FA) delivers the datagram to the mobile node. Datagrams from the MN to the Internet host are sent using normal IP routing procedures. If the mobile node is on a foreign network, the packets are delivered to the foreign agent. The FA forwards the datagram to the Internet host. In the case of wireless communications, the above illustrations depict the use of wireless transceivers to transmit the datagrams to the mobile node. Also, all datagrams between the Internet host and the MN use the mobile node's home address regardless of whether the mobile node is on a home or foreign network. The care-of address (COA) is used only for communication with mobility agents and is never seen by the Internet host. The mobile node is an end system or device such as a cell phone, PDA (Personal Digital assistant), or laptop whose software enables network roaming capabilities. The home agent provides several services for the mobile node and is located in the home network. The tunnel for packets towards the mobile node starts at home agent. The home agent maintains a location registry, i.e. it is informed of the mobile node's location by the current COA (care of address). Following alternatives for the implementation of an HA exist. Home agent can be implemented on a router that is responsible for the home network. This is obviously the best position, because without optimization to mobile IP, all packets for the MN have to go through the router anyway. If changing the router's software is not possible, the home agent could also be implemented on an arbitrary node in the subset. One biggest disadvantage of this solution is the double crossing of the router by the packet if the MN is in a foreign network. A packet for the mobile node comes in via the router; the HA sends it through the tunnel which again crosses the router. The foreign agent can provide several services to the mobile node during its visit to the foreign network. The FA can have the COA (care or address) acting as a tunnel endpoint and forwarding packets to the MN. The foreign agent can be the default router for the MN. Foreign agent can also provide security services because they belong to the foreign network as opposed to the MN which is only visiting. In short, FA is a router that may function as the point of attachment for the mobile node when it roams to a foreign network delivers packets from the home agent to the mobile node. The Care- of- address defines the current location of the mobile node from an IP point of view. All IP packets sent to the MN are delivered to the COA, not directly to the IP address of the MN. Packet delivery toward the mobile node is done using a tunnel. To be more precise, the COA marks the endpoint of the tunnel, i.e. the address where packets exit the tunnel. Foreign Agent COA: The COA could be located at the foreign agent, i.e. the COA is an IP address of the foreign agent. The foreign agent is the tunnel endpoint and forwards packets to the MN. Many MN using the FA can share this COA as common COA. Co-located COA: The COA is co-located if the MN temporarily acquired an additional IP address which acts as a COA. This address is now topologically correct, and the tunnel endpoint is at the mobile node. Co-located address can be acquired using services such as DHCP. One problem associated with this approach is need for additional addresses if MNs request a COA. This is not always a good idea considering the scarcity of IPv4 addresses. At least one partner is needed for communication. The correspondent node represents this partner for the MN. The correspondent node can be a fixed or mobile node. The home network is the subset the MN belongs to with respect to its IP address. No mobile IP support is needed within this network. The foreign network is the current subset the MN visits and which is not the home network. During the agent discovery phase the HA and FA advertise their services on the network by using the ICMP router discovery protocol (IROP). Mobile IP defines two methods: agent advertisement and agent solicitation which are in fact router discovery methods plus extensions. Agent advertisement: For the first method, FA and HA advertise their presence periodically using special agent advertisement messages. These messages advertisement can be seen as a beacon broadcast into the subnet. For this advertisement internet control message protocol (ICMP) messages according to RFC 1256, are used with some mobility extensions. Agent solicitation: If no agent advertisements are present or the inter arrival time is too high, and an MN has not received a COA, the mobile node must send agent solicitations. These solicitations are again bases on RFC 1256 for router solicitations. The main purpose of the registration is to inform the home agent of the current location for correct forwarding of packets. Registration can be done in two ways depending on the location of the COA. If the COA is at the FA, the MN sends its registration request containing the COA to the FA which is forwarding the request to the HA. The HA now set up a mobility binding containing the mobile node's home IP address and the current COA. Additionally, the mobility biding contains the lifetime of the registration which is negotiated during the registration process. Registration expires automatically after the lifetime and is deleted; so a mobile node should register before expiration. After setting up the mobility binding, the HA send a reply message back to the FA which forwards it to the MN. If the COA is co-located, registration can be very simpler. The mobile node may send the request directly to the HA and vice versa. This by the way is also the registration procedure for MNs returning to their home network. A tunnel is used to establish a virtual pipe for data packets between a tunnel entry and a tunnel endpoint. Packets which are entering in a tunnel are forwarded inside the tunnel and leave the tunnel unchanged. Tunneling, i.e., sending a packet through a tunnel is achieved with the help of encapsulation. Tunneling is also known as "port forwarding" is the transmission and data intended for use only within a private, usually corporate network through a public network.